Start your pasta water first because this spinach-walnut pesto will be ready long before your spaghetti is cooked. It takes about five minutes to make this super healthy topping for pasta or almost anything else like a chicken breast, fish fillet, or one of my favorites… a chicken pesto sandwich. 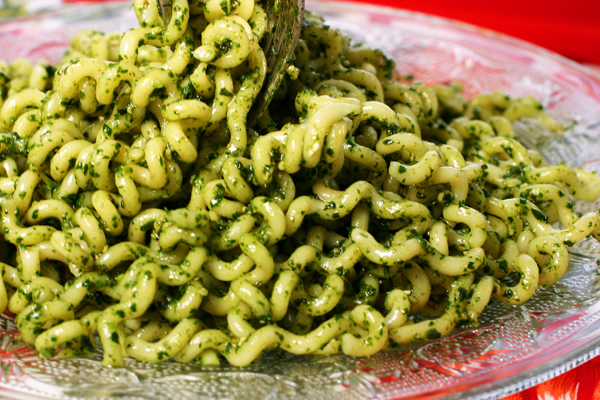 Traditional pesto uses all basil and pine nuts but by switching some of the basil out with fresh baby spinach and using walnuts instead of pine nuts, this becomes a much healthier sauce. Spinach can protect you from cancer, heart disease, stroke, macular degeneration and cataracts. It’s also called “brain food” because it may slow the aging of your brain. And both olive oil and walnuts provide heart-healthy fats to protect your heart. Even the garlic is good for your circulation and blood pressure. There. That should be enough reasons to try this simple, quick and easy, super-healthy pesto. It only takes five minutes because I use pre-washed spinach – a whole bag of it! My food processor holds eleven cups and it’s chock full when I put all the ingredients in but it does process down nicely. If yours seems too full, you can start with half the spinach at first, then add the rest of it after the oil. And use more or less of anything: more garlic, less spinach, it won’t matter. Just taste it at the end for salt… and enjoy. Click here for the recipe. 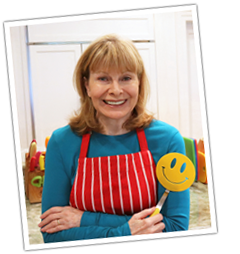 2 Comments on "Spinach-Walnut Pesto"
This is healthy and easy – thank you. You can make it with walnuts too.